3052 - SOUTH DAKOTA large flag shield embroidered patch. 3.5" tall x 2.75" wide - Patches sew or iron-on & are carded to hang on a display rack for stores. 3055 - SOUTH DAKOTA medium flag shield uniform or souvenir embroidered patch. 2.5" wide x 2.75" tall - Patches sew or iron-on & are carded for a retail display for stores. 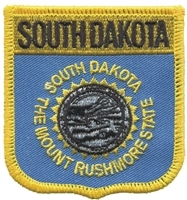 3053 - SOUTH DAKOTA Mount Rushmore souvenir shield embroidered patch. 2 1/16" wide x 2 13/16" tall - Patches sew on & are carded for retail display. Made in USA.